Paris in the Spring? Well, it’s not quite the same as seeing it in Fall, when the Paris Auto Show comes rolling along, but it will do for now. There’s so much in Paris that I’m only putting in a few things that I feel like putting in. If you would like to see more things, and I’ll see what I have. My Travel Tips are down here somewhere near the bottom. 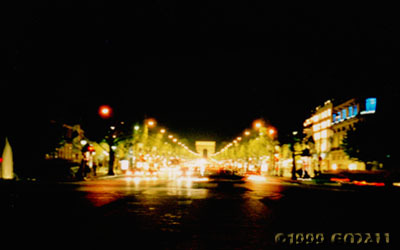 Arguably one of the most famous streets in the world, the Champs Élysées is almost magic at night. Remarkably, I wasn’t hit as I took this picture from the middle of the street looking towards the Arc de Triomphe. I’ve only walked here at night, so I don’t know what it’s like in the daytime. However, I would definitely recommend a night walk. 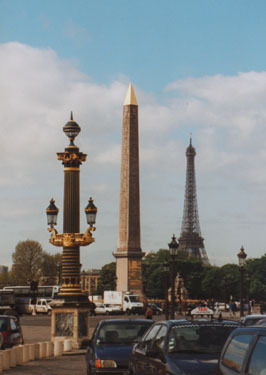 On one end of the Champs Élysées is the Arc de Triomphe, and on the other is the obelisk (Obélisque) at Place de la Concorde, which you can see here with the Eiffel Tower in the background. You can easily spend several days if you want to see everything. You can walk to many of the places, as they are close together. If you’re American and not used to walking (like me), I recommend lots of practice before hand. If you don’t already know French, learn the words for foods in restaurants first. The Louvre requires at least an entire day, if you want to see most of it. Some museums are closed on Mondays. Some close on Tuesdays. Find out which if you plan on being there these two days. Traffic circles are free-for-alls. Good luck. Keep an eye out for motorcycles -- they like to ride (quickly) between cars in traffic. Bring a book for reading in traffic jams. Do drive in the French countryside. The roads other than the Autoroute are pretty scenic, and there’s no toll. Buy a “carnet” for the Metro -- it’s a subway ticket pack of ten. This is one of the best ways to get around in Paris. Make sure the tickets are not used! We didn’t have any problems with crime in Paris, but it is a large city, and I have heard stories from other friends. Be smart. Throwing pennies or para-sailing off the Eiffel Tower is frowned upon. You can eat in fancy restaurants, or save a bunch of francs by eating in bistros and cafés and be just as full. You may want to save some of your money as souvenir trinkets. The Euro dollar is coming soon, and traditional national currency (like the French franc) will be going away. Try to see something outside of Paris if you can (and not Euro Disney).